I'm sure you've all noticed I'm quite a big fan of Disney Princesses. So it surprised me when I realized early this year that I had not done a single Disney cosplay. Luckily I made up for it quickly by making my Jessie costume with my friend as Buzz. But I still felt unsettled that I hadn't done a princess! If you follow my Instagram then you know I have done *two* now! 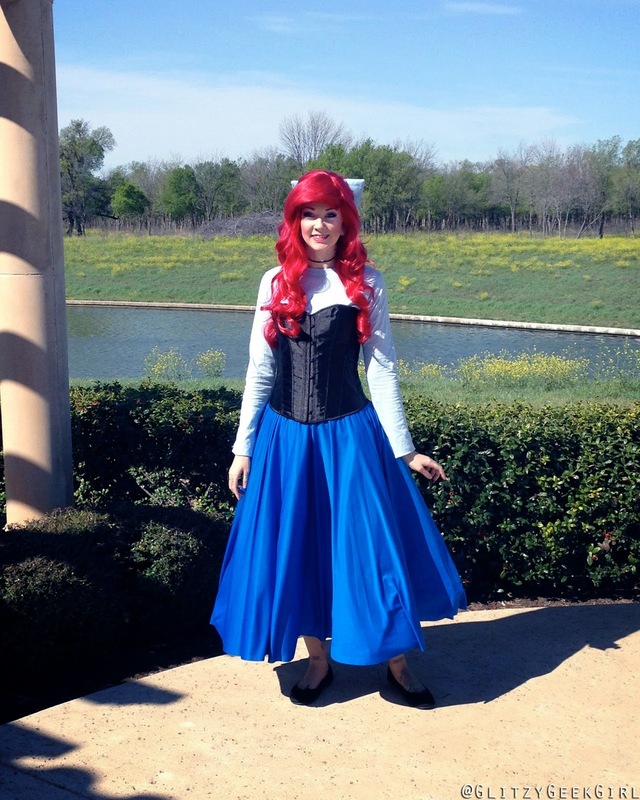 So it is my pleasure to share with you my first Disney princess - Ariel in her sight seeing dress! This is an excellent cosplay for a beginner! It's easy to wear, very recognizable, and kids love it. I enjoy making my cosplays, but I am not a fan of dress patterns. Also, sometimes there's just not enough time in the day. So for Ariel I searched the web for the perfect pieces to put her together. This ships from UK, but was a good price and still arrived quickly. I ordered a XXL because I wanted the sleeves to be long enough. I then altered it to fit tighter in the waist and armpits. This is a plastic boning corset, but let me tell you the quality is still amazing! It has a modesty panel in the back behind the ribbons and was very comfortable to wear. I colored the silver snaps with a black magic marker. I am wearing an XL in the photos, but I wish I had got a Large. Body Wrappers sells several fantastic dance wear apparel. This skirt is super flowy and lightweight. The waist is an elastic band and was comfortable. It lays very flat so I recommend wearing a petticoat under it. This shipped SO quickly and is super great quality. You have the option to take the hoop out, which I ended up doing. But if you want more of a ball gown look the hoop helps with that. Any black flats will work. I've had mine for years. I purchased my hair bow from AngiViper's Etsy store. This is the "puffy" version. It attaches with a clip and was shipped very quickly! I definitely recommend checking out her Etsy store as well as her fantastic cosplays! The wig was a little stressful. I ordered this wig from Etsy and was very disappointed. I do not recommend purchasing it. It was so flat on top I could see the netting! It had no bangs to work with no matter how much I teased them. Also, the part was nearly in the middle rather than the side so I had to turn the wig to get a side part. It was absolutely not worth the price. The seller was pleasant and offered to add more wefts of hair, but I knew what I was wanting and decided to fix it myself. I tried on my Black Widow wig to see if that would add more volume to the top and it looked great! 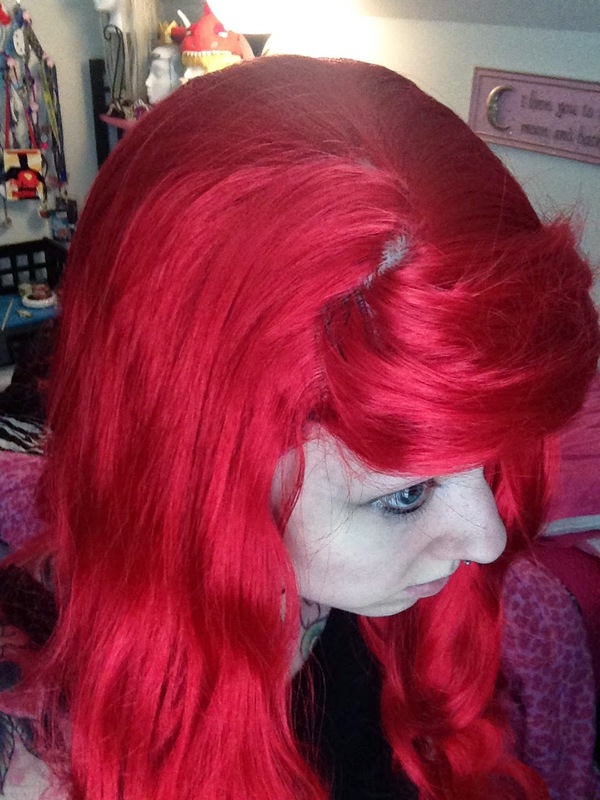 So I ordered a Ferrari in Apple Red from Arda Wigs and wore it on TOP of my poor Etsy wig. What I would recommend for you is to purchase a Luthien and Ferrari and layer the two. 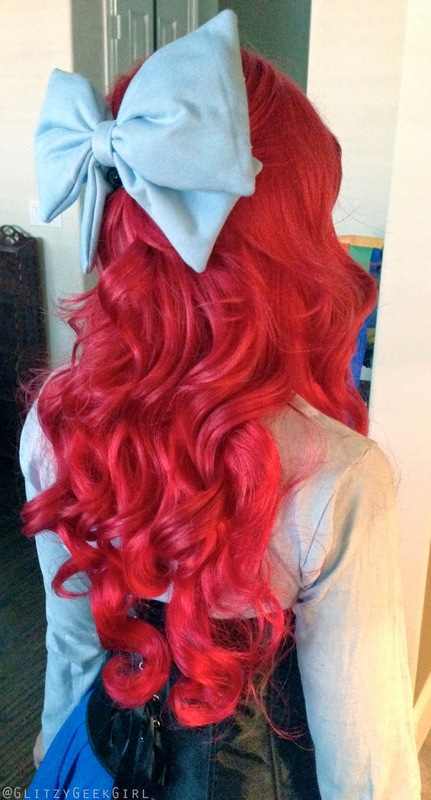 I don't think one single wig will give the illusion of Ariel's voluminous style. But the Ferrari's bangs are so thick all I did was tease them a little and they were done! 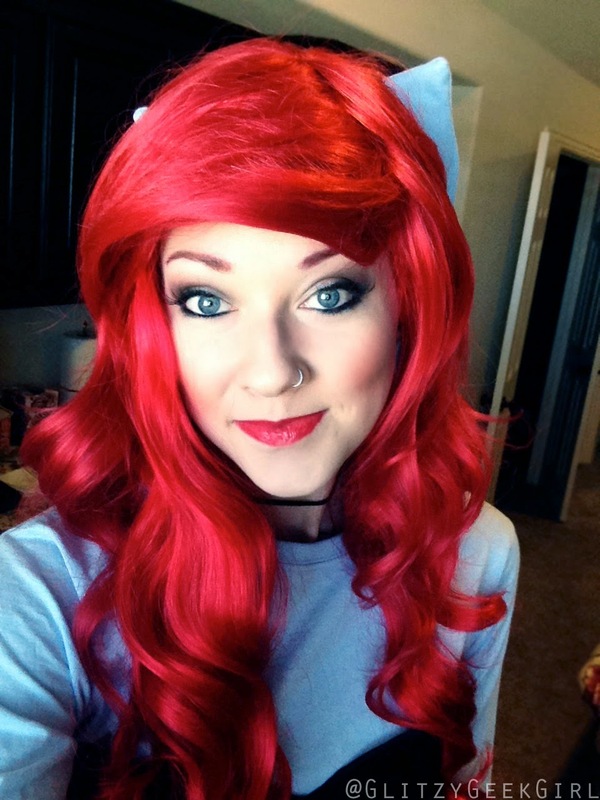 Ariel has some very bold features when it comes to her makeup. She's rockin' that fabulous red hair so that means her brows and lips are strong as well. For my makeup, I put on a lot of foundation to give myself smoother looking skin. Then I applied a deep pink to my cheeks and a dark brown eyeshadow. I focused my eyeliner to be heavier on the sides to make my eyes look bigger and also wore false lashes. My eyebrows are very light naturally so I used a small brush to cover them with some red and brown eyeshadow. My lipstick is MAC's Ruby Woo and was PERFECT! I really felt like a princess! 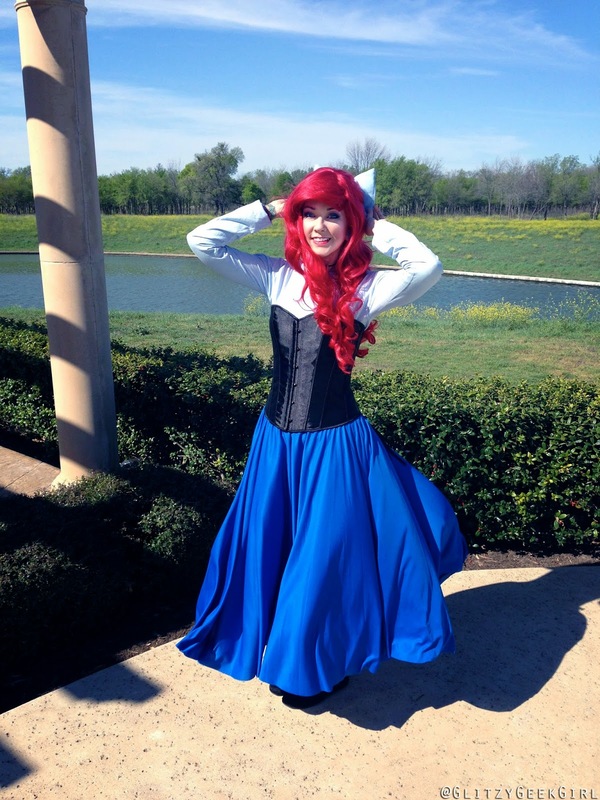 And that's how you cosplay Ariel from The Little Mermaid! I plan to wear this again on Friday to Dallas Comic Con 2014. I can't wait to get more pictures in it. All of these photos were taken by my mom, April Miller! If you could dress up as any Disney Princess who would you pick? I love this :) Its nice to see an outfit put together from other pieces found around the net. Just shows you can make a fantastic costume without making everything from scratch! Sometimes if you add up the time and cost of making something from scratch you might get in over your head. So this costume really was fun to see it all fall into place! I just had to tweak a few things and enjoyed doing that! 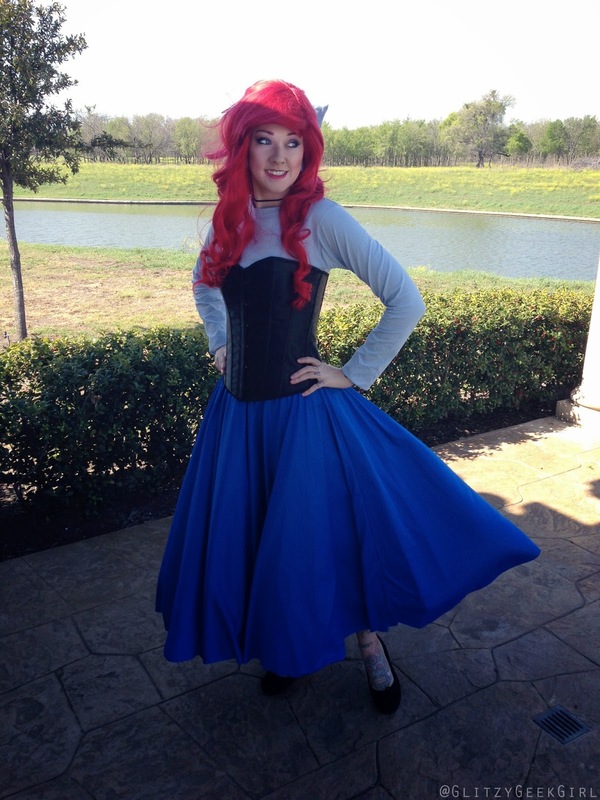 You make a gorgeous Ariel!! How does it feel wearing two wigs? Is it noticeably heavier than just the one? How did you get them to stay in place? I would never even have thought of wearing two and I think it's a great idea. It really wasn't that heavy wearing two wigs. Since the bottom one was so poor/thin and the top wig was shorter it balanced out just fine. I just put one on top of the other and they never seemed to slide out of place at all! You look adorable and what a genius way to fix the wig issue! How did you get the wigs to look so nice together? I see in the one picture that you just put the one on top of the other. How did you get the top wig to stay on for one, and how did you get them to intertwine so nicely? I flattened the bangs on the bottom wig and pushed them over to the side. Then I literally just put the top wig on over it. Arda wigs have little straps on the inside that let you tighten them so it stayed on snuggly without any pins or clips. I'm pretty lucky that the colors blended perfect! Alright, thank you so much! 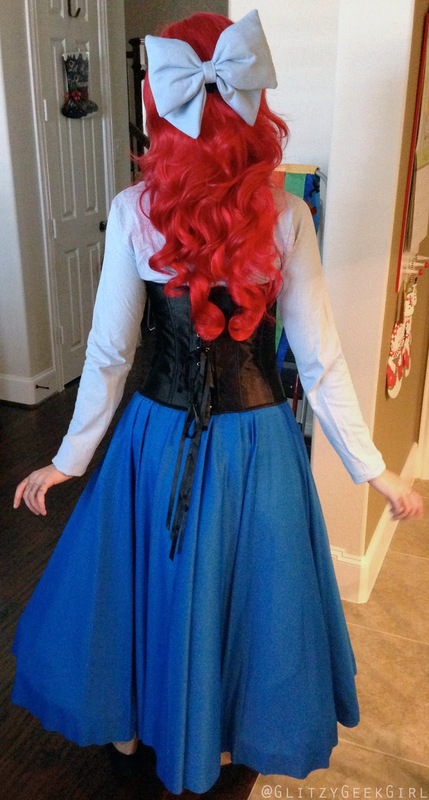 I'm working my way through the Disney princesses myself and I just couldn't find a wig. I've wasted my money on two wigs and once I found this it was almost like lightbulb haha. But anyway. Thanks a bunch. You're gorgeous! Thank you so much I was having a lot of trouble with finding the skirt and shirt and your two links were perfect. Honestly I didn't have enough for all 3 pieces so I found a different corset but thank you so so so much for the other pieces, and your wig tutorial was perfect!!! Thank you so much for the help. She is my favorite princess and I really wanted to cosplay her right! Will definitely be checking them out, I love this set it's so cute! This is really fantastic for those of us who aren't comfortable making a costume from scratch just yet. Thank you for sharing! I noticed that the skirt's reviews on Amazon show that it fits rather small? You provided a link to the large - just wondering what your opinion is on the skirt's sizing? I would normally be a large but I'm thinking I need to go to at least the x-large (I'm 5'11 145lbs 30 inch waist). What's your recommendation based on the size you ordered and how it fit? Thanks for your help! omg thank you soooooo much i have spent the past week trying to find a skirt and all of them just didnt fit the picture in my head but yours is perfect and that was the only thing i needed!!!! your the best! omg i have spent the past week trying to find a skirt and all of them just didnt fit the picture in my head but yours is perfect and that was the only thing i needed!!!! your the best! Hi! I realize this post is almost two years old, but I found the link while looking for a wig for Jessie from Toy Story. 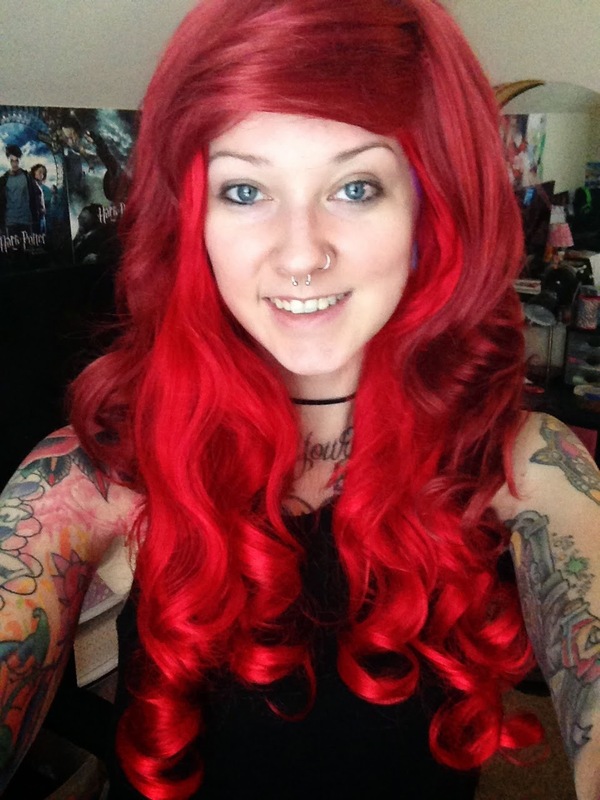 I got the link to the DIONYSUS- 24" APPLE RED STRAIGHT LONG COSPLAY WIG you shared, and that looks good. I'm just wondering if it is long enough to braid. 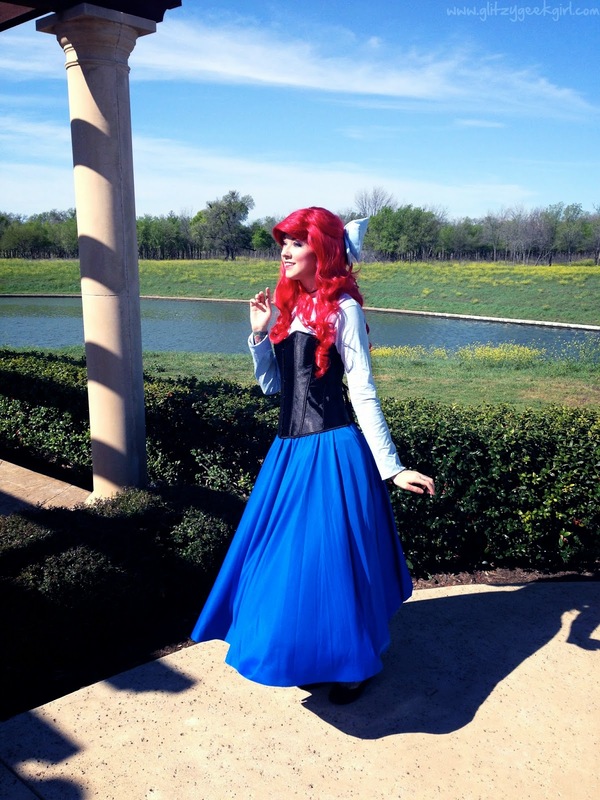 I also have a Little Mermaid costume I plan on wearing someday, so I was wondering if you would recommend getting the Luthian or Ferrari wig and using it for both Jessie & Ariel? (I'm not too worried about getting the fullness you wanted for Ariel). Thanks for your help! Finally found this after months of searching and i absolutely love it, cannot wait to do this for comic con Glasgow, i also realized i watch you on twitch you so amazing. thank you for being such an amazing person! !